On the one hand they are important energy sources and on the other hand flavor carriers. You probably use them a lot in your kitchen. 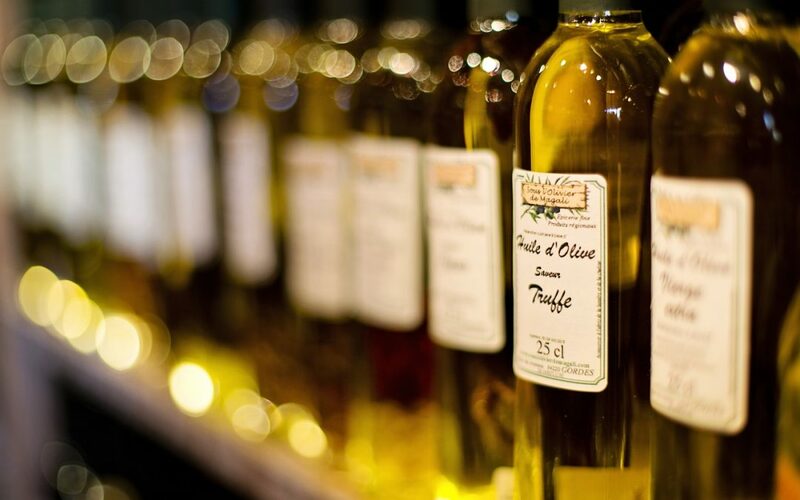 More than 90 % of the edible oils consist of Triacylglycerides (TAG). The TAG is a glycerol backbone esterified with different fatty acids. However, each oil has its own characteristic composition depending on the plant origin. Due to this characteristic composition a purity and quality control can be performed. Which one is the best technique to analyze oils? At the moment there are several methods accepted by the DGF (Deutsche Gesellschaft für Fettwissenschaft) and the AOCS (American Oil Chemists‘ Society) to analyze edible oils. Among these methods there are different titrations to determine the iodine, acid, saponification, and peroxide numbers. Gas chromatography is used to determine the fatty acid composition and high performance liquid chromatography to characterize the phospholipids. 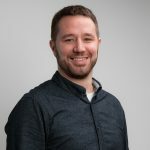 These renowned methods are well known and allow a good comparison of the results but make it difficult to implement new methods and innovations. And such an innovation already exists – the NMR spectroscopy!! Using 1H-, 13C-, and 31P-NMR spectroscopy we can determine all the parameters in only a few measurements. 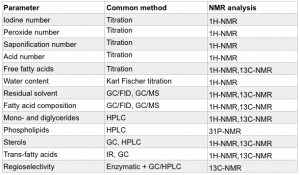 A single 1H-NMR measurement for example can replace several titrations methods (Tab. 1) and would thus save a lot of chemical and sample amount, time and money. The overall composition is easily to determine by NMR spectroscopy and the workload would be reduced significantly. A further advance of the NMR analysis is the extensive selectivity compared to the other methods. The determination of the iodine number by titration for example can be interfered by potential accompanying substances like squalene. Especially in the 1H-NMR spectrum (Fig. 1), it is possible to distinguish between several substances such as free fatty acids, peroxides, aldehydes, sterols, diacylglycerides (DAG), saturated and unsaturated fatty acids, and characteristic substances such as squalene in olive oil. 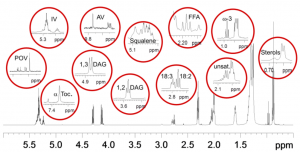 Furthermore, as presented in Christina Skiera’s dissertation (1H-NMR spectroscopic determination of deterioration maker compounds in fats and oils), NMR spectroscopy is also able to distinguish between different types of peroxides and the second oxidation product, the aldehydes – qualitatively and quantitatively. By analyzing carbons, several oils samples can be compared by their lipid profile. The total fatty acid composition was determined by a combination of 1H and 13C-NMR spectroscopy. By means of this composition the classification of an oil sample can be performed and blends can be identified. As presented, NMR spectroscopy is a very powerful tool for the holistic control of edible oils including the fatty acid profile and quality parameters which are classical analyzed by several titrations. Stay interested in innovations! Stay interested in quality! The next time you´re standing in front of your pan make sure you use the right oil! If you are not sure, ask us, we will analyze it for you!